Plains garter snake (Thamnophis radix) is a medium-sized, nonvenomous snake. It is found through Minnesota except in the arrowhead region, but is most common in the western and metro counties. It is similar in appearance to, and difficult to distinguish from, the much more common and widespread eastern garter snake (Thamnophis sirtalis sirtalis). The two species are distinguished by the position of pale lateral stripes and by markings on the upper jaw. 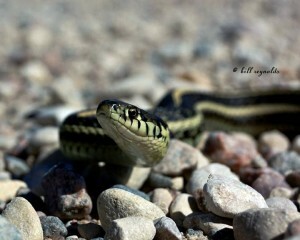 Plains garter snake has pale lateral stripes on the third and fourth scale rows counting up from the belly scales. Each of the scales on the upper jaw (labial scales) has a bold black outline. 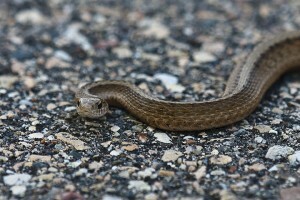 Eastern garter snake has pale lateral stripes on the second and third scale rows, and none or at most one or two of the labial scales have a bold black border. This entry was posted in Reptiles and tagged Plains garter snake, Thamnophis radix on May 12, 2015 by John Valo. 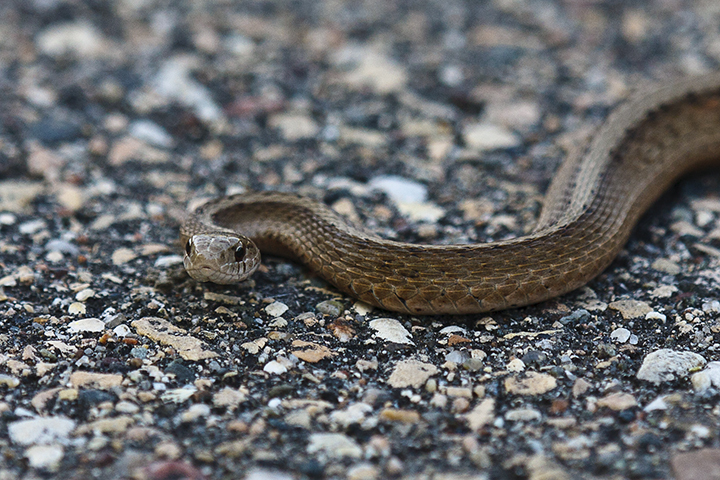 Texas brown snake (Storeria dekayi texana) is a small, nonvenomous, snake, the second smallest snake found in Minnesota. It is relatively common but not often seen except by professional and amateur herpetologists. Although it is active during the day it is most often found by turning over a rock or a board lying on the ground. When threatened it will strike repeatedly, but its bite is neither venomous nor painful. Its mouth is not big enough to bite humans. This species is identified by a row of black spots on each side of the pale dorsal stripe; and the cream-colored belly scales that are unmarked except for a very small black spot at each end. This entry was posted in Reptiles and tagged Storeria dekayi texana, Texas brown snake on November 20, 2014 by John Valo. 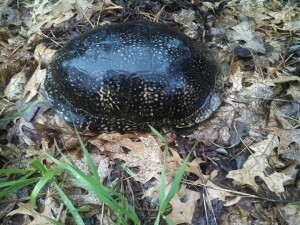 Blanding’s turtle (Emydoidea blandingii) is a long-lived, medium-sized turtle. Its conservation status in Minnesota is threatened and it is listed as a species in greatest conservation need. Threats include habitat degradation and road mortality. It occurs mostly in the eastern half of the state but also in scattered locations in western Minnesota. It is seldom seen because it is the first turtle to submerge when disturbed and the last to emerge after being disturbed. This species is identified by the smooth, high domed shell and by the bright yellow chin and throat. This entry was posted in Reptiles and tagged Blanding's turtle, Emydoidea blandingii on October 30, 2014 by John Valo. Western fox snake (Mintonius ramspotti) is a medium to large, nonvenomous, rat snake. It is one of the four largest snakes in Minnesota. Adults are usually 36″ to 56″ in length. In Minnesota it occurs mostly in the Mississippi, St. Croix, and Minnesota River valleys. It can be found from April to October in prairies, agricultural fields, woodland openings and edges, lowland meadows, river bottoms, and rocky outcroppings near water. In the spring and fall adults move about during the day. In the hot summer they move about at night. When confronted they will often vibrate their tails producing a buzzing sound. 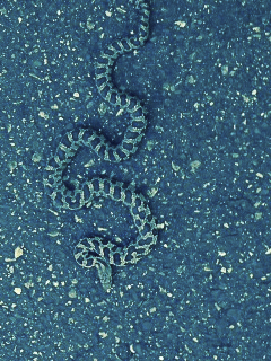 In leaf litter or dry grass the sound resembles that of a rattlesnake. The reddish head resembles a copperhead. For these reasons the snake is often mistaken for a poisonous one and killed by humans. This entry was posted in Reptiles and tagged Elaphe vulpina, Mintonius ramspotti, Pantherophis ramspotti, Pantherophis vulpinus, western fox snake on October 13, 2014 by John Valo.